PORTO ALEGRE, Brazil, Mar 12 2013 (IPS) - As part of the country’s growing emphasis on green tech research, Brazilian scientists have developed plastic solar panels that could revolutionise power generation from this clean, renewable energy source. What looks like a thin, flexible sheet of regular plastic is actually a solar panel printed with photovoltaic cells, which convert sunlight into electricity. This new material, totally unlike the heavy and costly silicon-based panels commonly used to generate solar power today, was created by scientists at CSEM Brasil, a research institute based in the southeast Brazilian state of Minas Gerais. 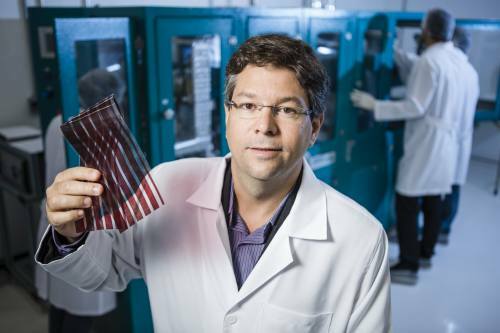 Made by incorporating organic photovoltaic cells into common polymers, the new panels resemble transparent sheets of plastic with stripes where they have been printed with carbon-based organic polymers. The technology to produce these organic photovoltaic cells has been studied in Europe and the United States for a number of years, and has now been further developed in Brazil. According to its inventors, the new “solar plastic” could represent a minor revolution in the way clean energy is produced from sunlight. “While the capacity for power generation is almost the same, its small size means that it can be given uses that are almost impossible for silicon panels,” said the chairman of CSEM Brasil, Tiago Maranhão Alves, a physical engineer who participated directly in the research. The lightweight, flexible new material can be used to power the electrical components of automobiles and in electronic devices like mobile phones and wireless computer keyboards and mice. But the Brazilian researchers are concentrating on the production of solar panels, which can be used to cover relatively large areas, like windows. “A panel with a surface area of two or three square metres could be sufficient to generate the energy needed in a house lived in by a family of four,” Alves told Tierramérica*. “Because of its good cost-benefit ratio, it could also be an option for bringing energy to remote areas without electric power service. In Brazil (with a population of over 192 million) there are still close to a million places in this situation,” he added. Ease of transport is one of the main advantages of the new panels over silicon panels. “Because they are easy to transport, logistical costs are lower. In addition, people can take them with them when they move to a new home,” he said. The plastic can also be used to cover buildings and venues like airports and sports stadiums, avoiding the need to set aside an area for the installation of conventional solar panels. Some ten million dollars were invested in developing the formula for the new Brazilian-made material, and investment is expected to double in the coming year. “We are now going to study the best way to scale up the product. In its current state it could already be launched on the market, but the price should be analysed on a case-by-case basis,” said Alves. The resources invested, which also enabled the creation of CSEM Brasil, were provided through a partnership between the venture capital firm FIR Capital and the Centre Suisse d’Electronique et de Microtechnique (CSEM). The project has also received support from the Minas Gerais State Research Foundation (FAPEMIG). The method has not been made public, since it is still classified as a trade secret. “This is a multi-billion-dollar market, and there are a lot of research centres after this technology,” commented Alves. The breakthrough announced by the researchers in Minas Gerais reflects a growing trend in Brazil: investment in clean technologies. Last year, the Studies and Projects Financing Agency (FINEP), a public company administered by the Ministry of Science, Technology and Innovation, launched the Sustainable Brazil Programme, which will distribute some 10 million dollars in lines of credit for initiatives aimed at the preservation of natural resources. According to FINEP, the programme responds to a demand perceived by the agency, which over the last eight years has provided 2.3 million dollars in financing for projects with a “green” component. One quarter of these projects have involved clean energy production. André Pereira de Carvalho, a business administration professor, believes that the increase in funding for this type of research is a result of the fact that both private investment funds and public institutions view green tech as a lucrative field. “These organisations primarily evaluate whether the product is a good one, with a formula that is difficult to copy and the potential for large-scale production. This applies to any investment, whether it is in an information technology company or a green technology initiative,” said Carvalho, who has coordinated studies on innovation for sustainability. Compared to the United States, Japan or Germany, Brazil is still “in diapers” when it comes to the green tech industry, but it has the potential to learn to walk very quickly, Carvalho told Tierramérica. “A few years ago, an entrepreneur who wanted to invest in this sector would run into many more obstacles. Today there is still a degree of mistrust towards what is commonly viewed as a more costly niche market, but it has already become much easier to obtain financing,” he added. Cute, but what dies it cost? Hopefully cost will be less than it has today.. I will like to know if there is a factory production or only reseach? of four,” Alves told Tierramérica*. UK insolation provides 7p worth of electricity per square metre per day, averaged through the year. Figures for Brazil are around 50% higher, but this still seems like a wild exaggeration. It also overlooks the obvious problem that the energy is mostly provided when it isn’t needed. sigh…seriously…you slam this and you’ve never heard of batteries?…lol bless.